In Zoho Analytics, you can easily share your data, reports, and dashboards to any user privately. All the views shared will be accessible online from anywhere, anytime, to the shared user and there is no need for mailing them as attachments. The shared views will always have the current data and reflect the latest changes made. How do I share views? Can I share multiple views together? Can I share the folder in my Workspace? Can I share selected columns from my data table? What will my shared user see? Can I share views to users who are in my Contacts list? How many users can I share my reports with? Can I filter the data while sharing? Can I apply dynamic filtering while sharing? What are the default variables? Can I notify my users about the shared views? Can I edit the permission I have given? 1. How do I share views? 2. Can I share multiple views together? Yes, you can share multiple views together. In Explorer tab, select the required views and then share. 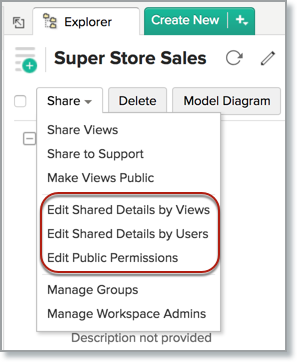 When sharing multiple views together, you will not be able to apply filter criteria. 3. Can I share the folder in my Workspace? Yes, you can share the folder in Zoho Analytics. To share views in a folder, click the Action icon that appears on mouse over and select Share views in this folder > To New Users. 4. Can I share selected columns from my data table? 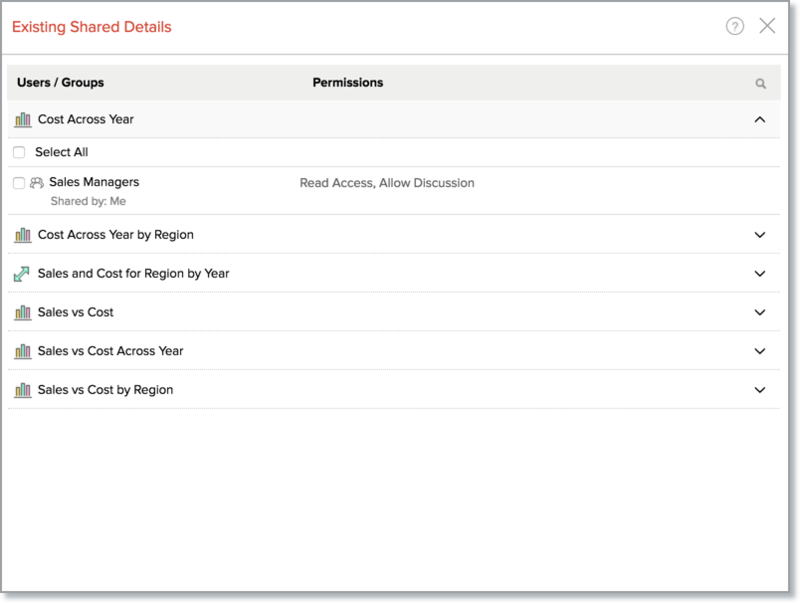 Yes, you can share selected columns from your table to users. 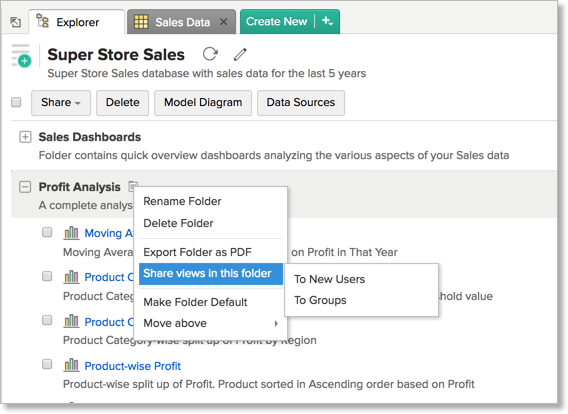 This enables you to control what data your users get to see and create reports upon. This will particularly helpful in case you have sensitive data in your table. You can share selected columns from your table by following the below steps. Open the view to share. Set the Sharing operations as stated before. Click Apply Permissions & Filters link. The Apply Permissions & Filters dialog will open. Click the All Columns link under Read Access and then select the columns to be shared. Share the table to your users. 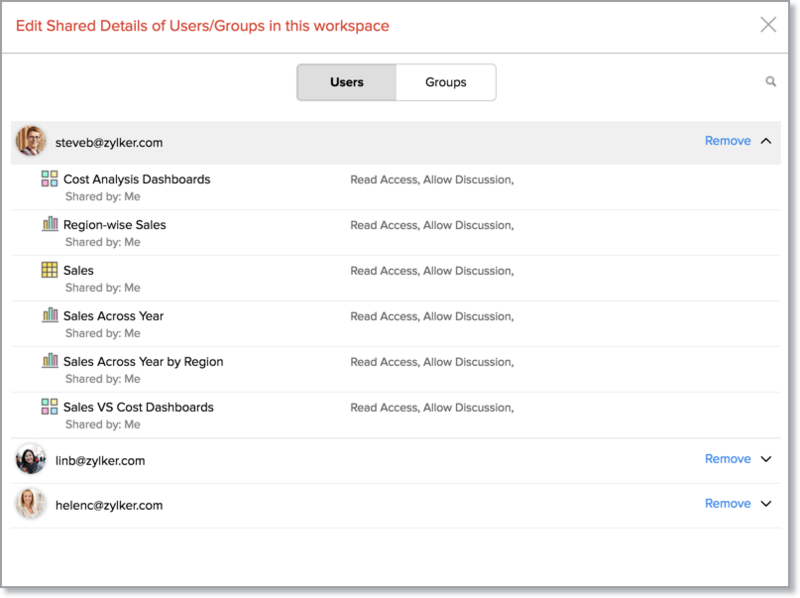 The Shared users will be able to access only selected columns for viewing and report creation. 5. What will my shared user see? 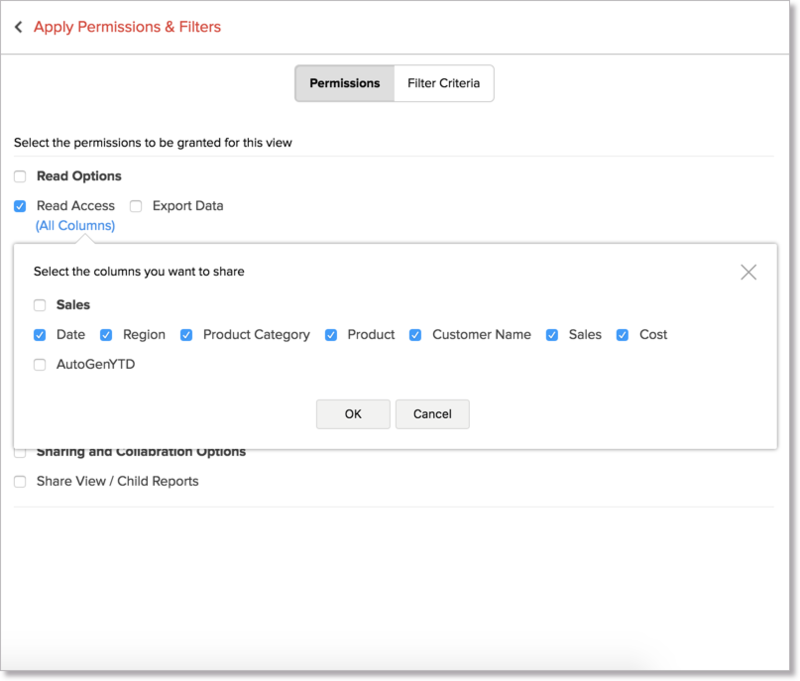 Zoho Analytics allows you to set fine-grained permissions while sharing views with users. So, they will have access to do only the permitted operations over the shared views. The below presentation provides a detailed explanation about sharing permissions. 6. Can I share views to users who are in my contacts list? Yes, you can share view to your contacts. Click Add Users From link. The Contacts dialog will open, listing your Zoho Contacts, Google Contacts, and Shared Contacts. You can share views to users in any of these lists. 7. How many users can I share my reports with? You can share your view with users allowed for your account. For more details refer our Pricing Page. 8. Can I filter the data while sharing? 9. Can I apply dynamic filtering while sharing? 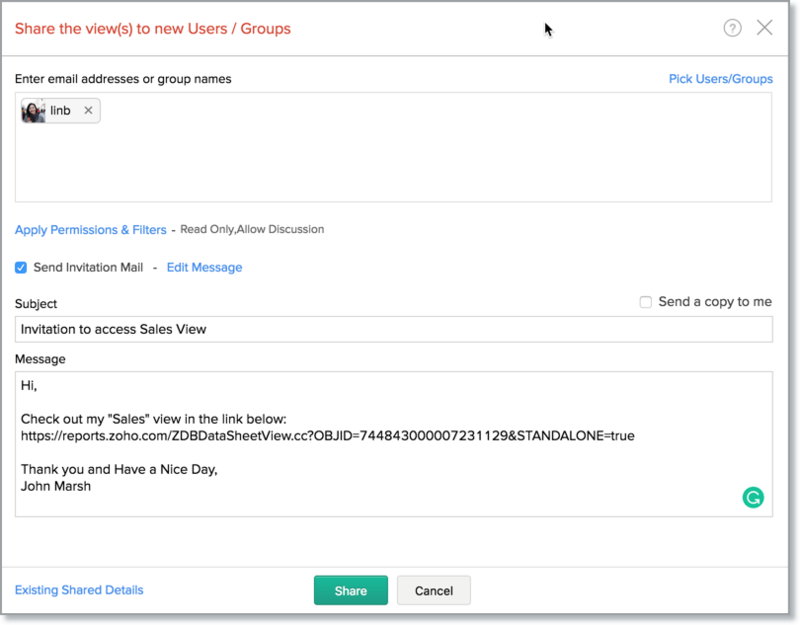 Yes, you can apply dynamic filtering while sharing using the Variables in Zoho Analytics. 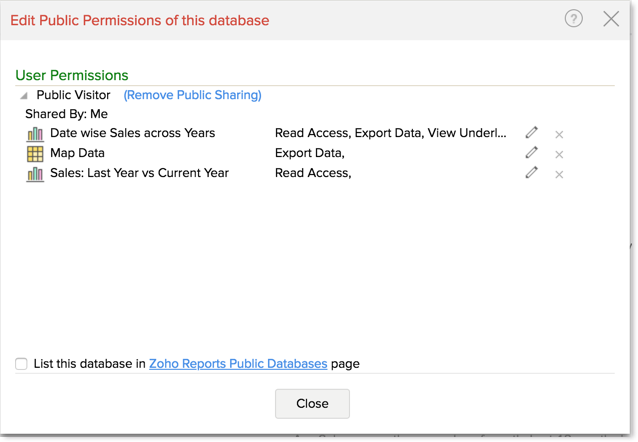 Zoho Analytics provides a set of system Variables and you can also create custom variables for sharing. Variables are placeholders that help the Account Administrator and the Workspace Administrators to assign dynamic values for individual users of the Workspace. Zoho Analytics provides a set of default variables. You can also create your own custom variable. You can further use these variables in the Sharing filter criteria to filter reports dynamically. Refer to the above question to know how to use the variable in filter criteria. 11. What are the default variables? Zoho Analytics provides a set of predefined system variables that you can use in your filter criteria. They are listed below. 12. How to create a variable? You can create variables from the Workspace Settings tab. Refer to our help document for more details on this. 13. Can I notify my users about the shared views? sing the Send Invitation Mail tab. You can edit the message on notification mail in the given field. You can also choose to send a copy of the notification mail to you. 14. Can I edit the permission I have given? Yes, you can edit the permission that you have given. Click Share and then choose one the following as needed. In the respective dialog that opens click the edit icon which appears on mouse over. 15. Can I remove sharing? Yes, you can remove sharing. Open the Existing Shared Details as specified in the above question and then click the trash icon corresponding to the view you want to remove sharing.